Matt Rychener, executive director/CEO of Sara’s Garden, left, is on hand to accept a check from the Wauseon VFW Post #7424 last Wednesday. The veterans held a fundraiser for Liam, a client of Sara’s Garden, and raised $2,136. 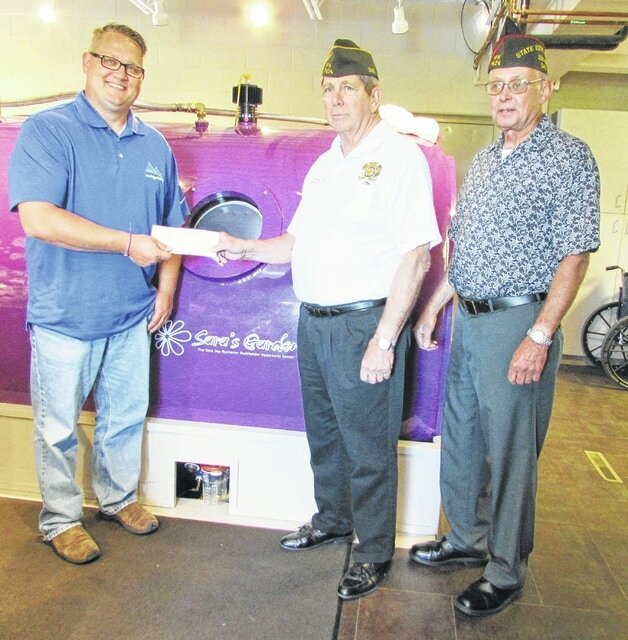 Incoming Post Commander John DeBarr, center, and Ervin Yoder, the post’s Quartermaster, deliver the check near the purple chamber. Now in its 10th year, Sara’s Garden continues to grow and reach out to those in need of their services.